The Amp Lamp Small by Normann Copenhagen is a sophisticated industrial style lamp made of glass and marble.It is part of the sophisticated range of the Amp lamp series by Danish designer Simon Legald. The lamps are characterized by their high-quality materials of glass and marble.These add a visual fragility and sensuous heaviness to the design.Amp is a range of small lamps inspired by old tube amplifiers from the 1960s. The unique shapes and classic materials of marble and glass add a nostalgic and at the same time, contemporary feel to Amp. The decorative bulb emits a stunning glow though glass lampshades, making a stunning contrast to the heavy marble.The designer has visually highlighted the essential details, such as the way the shade rests on the socket. 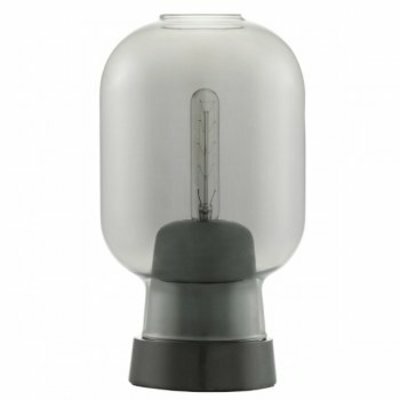 This draws attention to the fact that the shades can easily be removed for changing bulbs and cleaning.The transparent glass shade lets the light shine from the decorative light bulb in all directions. Amp takes up less space visually, allowing for many different applications in the home. Hang one Amp Lamp in the hallway, in a corner of the living room, or create a cluster of Amp Lamps over your dining room table for modern ballroom effect.The Amp Lamps come with a matching textile cord. Features:Material: Glass & Marble. Lamp is whitout buld.